Charcoal is the blackish material consisting mainly of carbon obtained by removing water and other volatile constituents from plant matter (such as wood) or animal matter (such as bone). Charcoal is usually produced by slow pyrolysis, the heating of wood, sugar, bone char, or other materials in the absence of oxygen. The resultant material is 85 to 98 percent carbon, with the remainder consisting of volatile chemicals and ash. It is soft, brittle, lightweight, black, and porous, and it resembles coal. Historically, wood charcoal was used as a constituent of gunpowder and as a reducing agent in the extraction of metals. In parts of the world where petroleum was scarce, automobiles and buses were converted to burn wood gas, obtained by burning charcoal or wood in a wood gas generator. Currently, charcoal is used for cooking (such as outdoor grilling) and some industrial processes. Activated charcoal, which is very porous and a good adsorbent, is used to filter water, adsorb odors, and remove undesirable colors. In medicine, activated charcoal is used to adsorb intestinal gases and to remove certain toxins. In addition, charcoal is used in art for drawing and making sketches. A person who manufactured charcoal was formerly known as a collier (or wood collier). The word "collier" was also used for a person who mined or dealt in coal, and for a ship that transported it. The first half of the word, "char-," is of obscure origin. It may have been derived from the old French word charbon, meaning "charcoal"; or it may have come from charren or churn (from the old English cerran), meaning "to turn." The second half, "-coal," appears to have been an adaptation of cole, meaning "coal." Thus the word "charcoal" would literally mean "to turn [some material] to coal." The independent use of "to char," meaning "to scorch" or "to reduce to carbon," is comparatively recent and is assumed to be a back-formation from the earlier charcoal. A wood pile (from around 1890) before it would be covered with turf or soil and fired. The production of wood charcoal in areas with an abundance of wood dates back to ancient times. It generally consisted of piling billets of wood on their ends so as to form a conical pile, openings being left at the bottom to admit air, with a central shaft to serve as a flue. The whole pile was covered with turf or moistened clay. The firing was begun at the bottom of the flue, gradually spreading outward and upward. The success of the operation depended on the rate of combustion. Under average conditions, 100 parts of wood yielded about 60 parts by volume (or 25 parts by weight) of charcoal. Small-scale production on the spot often yielded only about 50 percent, and large-scale production was efficient to about 90 percent by the seventeenth century. The operation was so delicate that it was generally left to colliers (professional charcoal burners). The massive production of charcoal (at its height employing hundreds of thousands, mainly in Alpine and neighboring forests) was a major cause of deforestation, especially in Central Europe. In England, many woods were managed as coppices, which were cut and regrew cyclically, so that a steady supply of charcoal would be available (in principle) forever. Complaints (as early as the Stuart period) about shortages may relate to the results of temporary over-exploitation or the impossibility of increasing production to match growing demand. The increasing scarcity of easily harvested wood was a major factor for the switch to the fossil fuel equivalents, mainly coal and brown coal for industrial use. The modern process of carbonizing wood, either in small pieces or as sawdust in cast iron retorts, is extensively practiced where wood is scarce, and also for the recovery of valuable by-products (wood spirit, pyroligneous acid, wood tar), which the process permits. The question of the temperature of carbonization is important; according to J. Percy, wood becomes brown at 220 °C, a deep brown-black after some time at 280 °C, and an easily powdered mass at 310 °C. Charcoal made at 300 °C is brown, soft and friable, and readily inflames at 380 °C; made at higher temperatures it is hard and brittle and does not fire until heated to about 700 °C. In Finland and Scandinavia, the charcoal was considered the by-product of wood tar production. The best tar came from pine, thus pinewoods were cut down for tar pyrolysis. The residual charcoal was widely used as substitute for metallurgical coke in blast furnaces for smelting. Tar production led to rapid deforestation: it has been estimated all Finnish forests are younger than 300 years. The end of tar production in the end of the nineteenth century meant also rapid re-forestation. The charcoal briquette, first invented by Henry Ford, was first made using wood and sawdust scraps from his automotive assembly plant. Commercial charcoal is found in either lump, briquette, or extruded forms. The characteristics of these forms vary widely from product to product. Lump charcoal is made directly from hardwood material and usually produces far less ash than briquettes. Briquettes are made by compressing charcoal, typically made from sawdust and other wood by-products, with a binder and other additives. The binder is usually starch. Some briquettes may also include brown coal (heat source), mineral carbon (heat source), borax, sodium nitrate (ignition aid), limestone (ash-whitening agent), raw sawdust (ignition aid), and other additives like paraffin or petroleum solvents to aid in ignition. One of the most important historical applications of wood charcoal was as a constituent of gunpowder. It was also used in metallurgical operations as a reducing agent, but its application has been diminished by the introduction of fuels such as coke or anthracite smalls. For example, charcoal may be used to smelt a variety of metals from aluminum to copper, as it burns at the necessary temperature: 1,100 °C (2,010 °F). A limited quantity is made into the form of drawing crayons; but the greatest amount is used as a fuel, which burns hotter and cleaner than wood. Charcoal is often used by blacksmiths, for cooking, and various industrial applications. Charcoal briquettes are widely used for outdoor grilling and barbecues in backyards and on camping trips. In many non-industrialized countries, charcoal is used for everyday cooking by a large portion of the population. This is potentially a serious health problem when used indoors since carbon monoxide (CO) is a combustion product. During periods of scarce petroleum, automobiles and buses have been converted to burn wood gas (gas mixture containing primarily carbon monoxide) released by burning charcoal or wood in a wood gas generator. In 1931, Tang Zhongming developed an automobile powered by charcoal, and these cars were popular in China until the 1950s. In occupied France during World War II, wood and wood charcoal production for such vehicles (called gazogènes) increased from pre-war figures of approximately fifty thousand tons a year to almost half a million tons in 1943. In the years immediately after the Second World War, charcoal buses were in regular use in Japan and are still used in North Korea. The porosity of activated charcoal accounts for its ability to readily adsorb gases and liquids; it is therefore often used to filter water and adsorb odors. Its pharmacological action depends on the same property; it adsorbs gases in the stomach and intestines, and also liquids and solids (hence its use in the treatment of certain poisonings). Charcoal filters are used in some types of gas mask to remove poisonous gases from inhaled air. Wood charcoal also to some extent removes coloring material from solutions, but animal charcoal is generally more effective. Animal charcoal or bone black is the carbonaceous residue obtained by the dry distillation of bones; it contains only about 10 percent carbon, along with 80 percent calcium and magnesium phosphates, the remainder being inorganic material originally present in the bones. It is generally manufactured from the residues obtained in the glue and gelatin industries. Its decolorizing power was applied in 1812 by Derosne to the clarification of the syrups obtained in sugar refining; but its use in this direction has now greatly diminished, owing to the introduction of more active and easily managed reagents. It is still used to some extent in laboratory practice. The decolorizing power is lost after the charcoal has been used for some time, but it may be revived by washing and reheating. Four sticks of vine charcoal and four sticks of compressed charcoal. 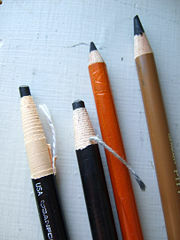 Two charcoal pencils in paper sheaths designed to be unwrapped as the pencil is used and two charcoal pencils in wooden sheaths. Vine charcoal is created by burning sticks of wood (usually willow or linden/Tilia) into soft, medium, and hard consistencies. Powdered charcoal is often used to "tone" or cover large sections of a drawing surface. Drawing over the toned areas will darken it further, but the artist can also lighten (or completely erase) within the toned area to create lighter tones. One additional use of charcoal rediscovered recently is in horticulture. Although American gardeners have been using charcoal for a short while, research on Terra preta soils in the Amazon has found the widespread use of biochar by pre-Columbian natives to turn otherwise unproductive soil into very rich soil. The technique may find modern application, both to improve soils and as a means of carbon sequestration. Charcoal was also consumed in the past as dietary supplement for gastric problems in the form of charcoal biscuits. Special charcoals are used in the smoking of the Hookah. Lit coals are placed on top of foil, which is placed over the bowl of tobacco, and through indirect heat "cook" the tobacco to a temperature that produces smoke, but does not burn. ↑ charcoal. Online Etymology Dictionary. Retrieved February 22, 2009. ↑ Henry Ford created the charcoal briquette from the wood scraps and sawdust from his car factory. smokepistol.com. Retrieved February 14, 2009. ↑ How charcoal briquettes are made. madehow.com. Retrieved February 14, 2009. ↑ Charcoal in the Forest of Dean. fweb.org.uk. Retrieved February 14, 2009. ↑ Smoke Detectors, Carbon Monoxide Detectors, and Charcoal. hc-sc.gc.ca. Retrieved February 14, 2009. ↑ Chris Pearson, 'The age of wood': Fuel and fighting in French forests, 1940–1944. published in Environmental History 11 (4) (October 2006) History Cooperative. Retrieved February 14, 2009. ↑ Rare photographs in Occupied Japan by John W. Bennett, Tokyo: views of the city; essay contains a small section on Charcoal buses in post-war Japan. OSU. Retrieved February 14, 2009. Emrich, Walter. 1985. Handbook of Charcoal Making. The Traditional and Industrial Methods. Dordrecht, NL: Reidel. ISBN 9027719349. Kelley, D.W. 2008. Charcoal and Charcoal Burning. Princes Risborough, UK: Shire. ISBN 0852637314. Rollinson, William. 1999. Making Charcoal. Otley, UK: Smith Settle. ISBN 1858250994. The Lump Charcoal Database - Information about lump charcoal. Charcoal Making - Charcoal making community for livelihood. How to Make Charcoal - Traditional charcoal production method, India. Catoctin Mountain Park - Charcoal and Iron Industry (U.S. National Park Service) Catoctin Mountain Park, Maryland, USA, includes interpretive features ("Charcoal Trail," etc) on the history of charcoal making in the area. This page was last modified on 1 February 2017, at 19:58.